Couple things before we get to the recipe, ‘kay?! First. Are feeling like you can’t get enough pumpkin in?! I think that after the pumpkin shortage of 2009 and 2010 all I want to do is make pumpkin this, or pumpkin that. After not using pumpkin in any recipes since earlier in the year (when my holiday stockpile ran out), I’m find myself trying to make up for lost pumpkin recipes! Second. I was playing around with my Pumpkin Chocolate Chip Muffin recipe last week and decided to try making them with our dairy-free butter instead of oil. Oh my moist-ness! They had the fluffiness and texture of a cupcake. But with the taste of the muffin. Third. I have already been dreaming about the desserts that I’ll be making for this Thanksgiving. 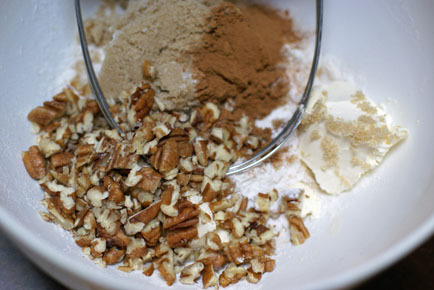 I’m thinking about putting a pecan spin on a pumpkin pie…but without the corn syrup. I’ve browsed a few Pumpkin Pecan Pie recipe…all of which call for corn syrup. So I think a little pumpkin and pecan pie experimenting is in order in the coming weeks. Finally. In a moment of culinary genius, I thought to make the new buttery, fluffy pumpkin chocolate chip muffins without the chocolate chips. And with a cinnamon pecan streusel topping. Preheat oven to 350. Grease 18 wells of regular size muffin tin. In a stand mixer or mixing bowl, combine together the butter or margarine and sugar until smooth. In a mixing bowl, toss together the flour, baking powder, baking soda, cinnamon, ginger, nutmeg and salt. Add the eggs, 1 at a time, to the butter and sugar mixture. Stir after adding each egg and scrape down the sides if using a stand mixer. Next stir in about half of the flour mixture, until smooth. Then add half of the milk and stir until smooth. Then repeat with the other half of the flour and milk. Finally mix in the vanilla and pumpkin puree. Let mix for 1-2 minutes, or until nice and smooth. Pour into the greased muffin wells. In a mixing bowl, combine all the ingredients and cut the butter in with a fork or pastry blender. 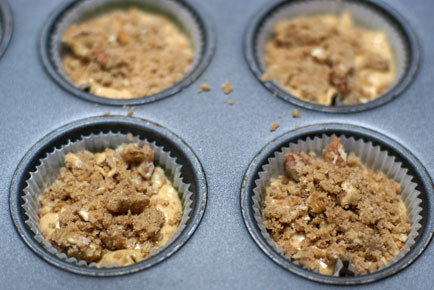 Once crumbly, add the topping to all the muffins. And be generous about it…much of the brown sugar and butter melts into the muffin as it bakes…and the pecans get crunchy on top. Bake in the preheated oven for 21-23 minutes. Makes 18 delicious and perfectly moist muffins. This recipe is featured on SouthernPlate.com’s Meal Plan Monday #31. Wish I had a muffin for breakfast! I love the streusel topping! 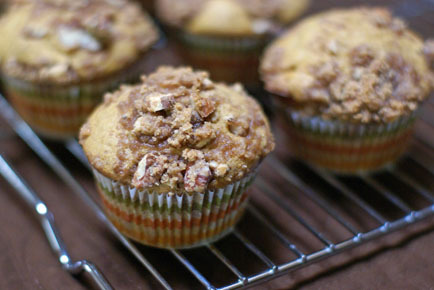 I just made these without the pecans (since my girls won’t eat nuts), and they are wonderful. I love the fact that they are not full sugar. Thank you for this great recipe. Pumpkin, Cinnamon, Pecan – Yum! I was in the pumpkin baking mood too. Yesterday, I made whole wheat banana pumpkin bread. It is devine. I have a pumpkin pecan pie recipe that does not require corn syrup. It may be a little out of the $5 range. It does call for rum and heavy cream. For those with nut allergies or that just don’t like nuts,try substituting oatmeal for the nuts. I’m wondering if I could double this recipe and just use one 15 oz. can of pumpkin or if it would mess up the muffins to only have 1 3/4 cup of pumpkin puree for a double batch? I’m not certain what to do with the extra 3/4 cup of pumpkin from the can and it would be great to be able to make 3 dozen muffins without extra time and effort. I divided my extra pumpkin puree out in 1/2 cup portions, placed in a ziploc bag and froze them. I freeze the extra in ice cube trays, then pop out the frozen pumpkin and put in a ziploc freezer bag to store it. Each pumpkin cube is about a tablespoon, so you can just thaw as many as you need for your recipe. Then you won’t have to open a whole new can of pumpkin if you just need a little bit for something you are making! I made these the first go-round and my daughters, who don’t usually like muffins . . . LOVED these. They have asked for them several times since and I couldn’t remember where I got the recipe. I’m so glad to see them here again. This time I’ll file the recipe in my recipe box. Thank you! !